The Best Ever Pizza Sauce is a big claim. The “Best” sauce really does vary depending on taste. 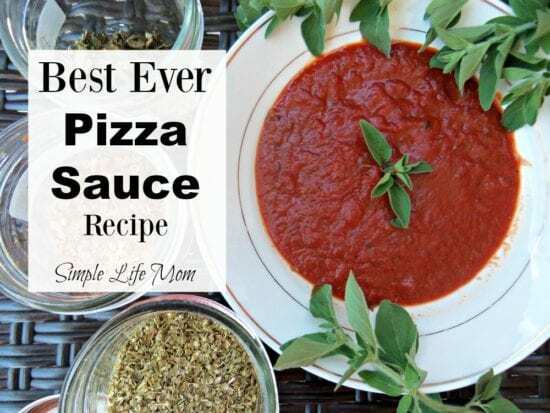 Some people like their pizza sauce sweet, while others like theirs overflowing with oregano and garlic. Some like less sauce so that the other flavors are balanced and accentuated (me), while others would rather their pizza swimming in sauce (my husband). It’s a matter of taste. Nevertheless, this sauce is awesome! The sautéd onions and garlic make all the difference. The added flavor from the saute and olive oil is significant. I’ve tried to short cut the recipe and add dried onions and garlic powder. You can really tell. It was not nearly as good, so take the few extra minutes to saute the fresh garlic and onions for that blow your mind flavor! You know it’s good when your family keeps trying other sauces and says, “This is nothing like your sauce, mom!” or “This is pretty good, but it’s still not as good as yours.” And believe me, they tell me when they don’t like something I’ve cooked, so they’re not just being nice 🙂 So I guess it passes the family test. 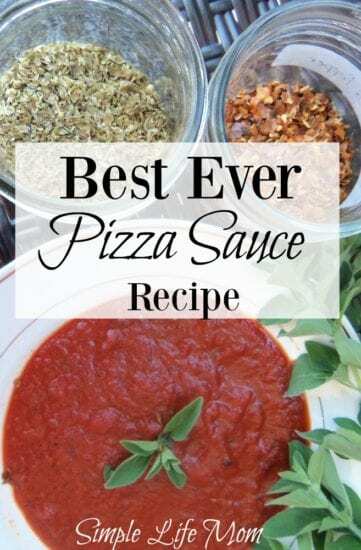 I use this sauce for almost everything requiring marinara, not just pizza. It will go in my Pizza Rolls, on Spaghetti, with Whole Wheat Pizza Crust and Bread Sticks, etc. Roughly chop onion and garlic and sauté in oil until onion is translucent. Blend onion and garlic in food processor (optional). Add onion and garlic to saucepan. Add tomato puree and remaining ingredients to the saucepan. Simmer until flavors blend - at least 20 minutes, but preferably 1 hour. My goodness, that looks so yummy 🙂 hungry now. Yes, once was eating different pizzas every day for 2 weeks, was awesome, my favorite food on the planet, can eat it steaming hot, warm, cold, even frozen if I have to 😀 Love it! Wonderful! Thanks for trying it. I’m glad you liked it. Sounds delicious i am going to try this sauce tonight ..what brand of tomatoes do you use? Roma make great sauce, but I’ve used others and they’ve turned it great as well.